In my view, GTC is a fundamentally attractive business that should have the wherewithal to survive the oil downturn. Plus, this holding could in time become a very lucrative recovery story — assuming profits can one day return to levels witnessed during recent years. The battered share price that does not appear to reflect any recovery potential. Just so you know, I first bought GTC during April 2013 and last bought during August 2014. I have paid as high as 69p and as low as 54p, and my average buy price is 59p. The recent market price of 33p gives a market cap of £10m and me a paper loss of 44%. Here comes the geoscience bit — Concentrate! Getech (GTC) was established during 1986 as a research group within the University of Leeds to compile and analyse data for oil and gas companies. Initial studies involved mapping the Earth’s magnetic field and gravitational pull, and almost 30 years later, the group has since compiled what it claims to be the world’s most extensive commercial library of geophysical information. I am not an expert geoscientist, but from what I can understand, small variations within the Earth’s magnetic field and gravitational pull can apparently highlight differing geological structures and varying rock densities. This information can then help exploration companies evaluate the likelihood of finding oil and gas within a particular area before a more expensive seismic study is performed. During 2000, the research group was spun out of the University of Leeds as a private company called Geophysical Exploration Technology Ltd. 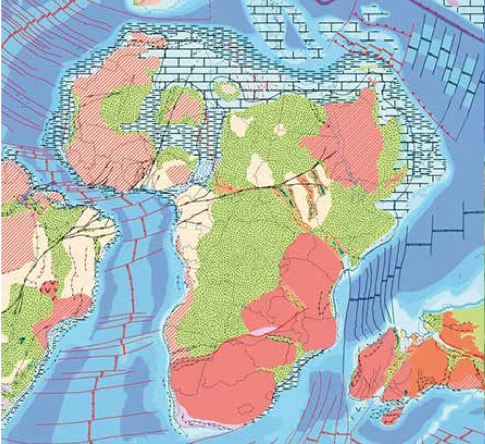 In recent years, the firm has complemented its magnetic and gravity studies by amassing a whole range of paleogeographic documentation, climatic and tidal models, tectonic plate analysis and public seismic reports to create a vast 3D exploration database. During 2005, the renamed Getech joined AIM and 2011 saw the launch of its flagship Globe product — where clients can sign multi-year contracts to gain full access to GTC’s database and documentation. In addition, GTC sells its data on a regional basis and can also supply bespoke reports and commissions. Clients include BP, BG, Royal Dutch Shell, ExxonMobil and Chevron, who all (according to GTC) find it quicker and cheaper to use GTC than create their own specialist service in house. Sadly for me, I failed to act after wondering whether the recovery was about to stall — and profits did indeed come in substantially below expectations for 2014. The shares, which joined AIM at 39p, traded as low as 12p during 2010 and as high as 105p during 2014. The recent 33p price gives a market cap of £10m — below the £11m seen at the float almost ten years ago. In particular, GTC revealed its largest-ever contract in September (a $5m deal with the Angolan state oil operator) and November’s annual statement claimed the group had a “strong foundation for growing the business in the short to medium term”. However, those comments were issued in November — when the oil price was about $78. Since then oil has lost 40% to $47, which leaves me doubtful as to whether GTC’s optimism will be maintained during 2015. I’m holding onto GTC because the accounts indicate it’s a decent business with the resources to survive the sector downturn (and hopefully prosper thereafter). Importantly for me, the balance sheet shows cash of £3.4m, no debt and no pension liabilities. A bonus is freehold property (the Leeds head office) with a book value of £2.5m. Margins underscore the notion GTC has a respectable competitive position. During 2012, 2013 and 2014, which coincided with the initial three-year phase of Globe, operating margins averaged an impressive 20%. In fact, margins based on aggregate sales, profits and losses recorded during the last ten years are a healthy 15%. I’m particularly impressed by GTC’s cash flow and how cash capital expenditure has been completely covered by the depreciation and amortisation charged to headline earnings. Meanwhile, working-capital movements appear sound — with the large outflow reported for 2014 due (I believe) to a flurry of sales booked just before the year-end where the associated invoices had still to be paid. I must admit GTC’s directors are not the obviously talented and shareholder-dedicated executives that I prefer to have running my shares. But as paid professionals go, there is more than enough in the boardroom to justify my backing. For a start, I’m encouraged by the loyalty of chief executive Raymond Wolfson. Mr Wolfson was a GTC non-executive years before the flotation, became chief exec in November 2007 and took full charge in October 2009 when GTC’s founder stepped down. Given the timing of his appointments, I can’t really blame him for GTC’s losses in 2009 and 2010 and I can’t fault him either for GTC’s performance thereafter. Among the other executives, technical director Dr Paul Markwick has worked at GTC since at least the flotation while sales director Professor Paul Carey joined the firm in 2011. Adding some clout to proceedings is the non-exec chairman, who is an ex-chief exec of Dana Petroleum, the former FTSE 250 business. Elsewhere on the board, I see the finance director has been a non-executive for more than ten years and his accountancy practice helps compile the annual figures. I’m pleased there is a ‘thin cat’ feel to this management team. Director pay appears quite modest, benefits have been minimal and, despite the bumper profits of 2012 and 2013, no bonuses have been disclosed. That said, GTC has been somewhat liberal with options. Potential dilution from past grants now runs at 9%, although the chairman alone has options representing 3% of the share base. The option count has been creeping higher over the years and is something I will have to monitor. Ordinary executive shareholdings are sadly minimal, but two former directors (including GTC’s founder) and a current non-exec do retain a combined 24%/£2.5m investment. Details about retrospective and future R&D tax credits. Simply put, the new R&D tax credits improved GTC’s profits and, combined with the upbeat comments, made the shares more attractive. By my calculations, the statement indicated aggregate earnings from 2012, 2013 and 2014 had been enhanced by at least £0.75m or 2.5p per share. This three-year period covered the first three-year phase of the Globe project, so I reckoned the shares were undervalued if earnings for 2015, 2016 and 2017 could repeat the tax-credit-enhanced figures for 2012, 2013 and 2014. All told, I was looking for average annual earnings of £1.4m, or 4.55p per share, for 2015, 2016 and 2017, which supported a P/E of less than 10 with a then enterprise value of £13m (a £16.4m market cap less the £3.4m net cash) at 54p. Back to today, those earlier assumptions now give a P/E of just 5 with the recent £6.6m enterprise value at 33p. The trailing 2.2p per share dividend supports a 6%-plus yield. But for what it is worth, I have (very roughly) calculated announced contracts for 2015 could produce sales of £4.4m, which will not leave room for any profit after applying last year’s 68% gross margin and £3.5m overhead. Still, there’s always that balance sheet to consider. At the last count, net tangible assets were £7.3m or 24p per share, of which net cash was 11p and that freehold was 8p. So at 33p we are not a million miles from book value. But we have been closer. During 2010, buying at the 12p low compared to a then book value of 10p per share. However, GTC was then recording losses and net cash amounted to just £7,000. As I mentioned earlier, the direction of the oil price can influence GTC’s progress significantly. Referring back to how GTC reported the difficult times of 2008 and 2009, the near-term omens do not look great right now. Six years ago, losses were racked up as the oil price dived below $40 and it took a rebound to $70 before GTC sounded a note of confidence. Furthermore, GTC’s clients cut their annual budgets at the start of 2009 and, despite the oil price recovering later that year, did not increase their spending until 2010. I worry that client expenditure will once again take some time to recover after any oil-price rebound. On the subject of clients, GTC is generally dependent on chunky contracts and during 2011, 2012 and 2014, the group’s two largest customers represented at least 23% of total sales. Not great when such customers might want to defer spending quite soon. Plus, I note Globe clients have dropped from ten to five after the initial three-year phase ended last year. I also see deferred income (upfront customer payments) has dropped from £2m to £1m, suggesting less interest for GTC’s products. I just wonder if the hatches ought to be battened instead. This has not been my greatest investment. I have been caught out badly by the oil-price slump and, given GTC’s history, I cannot see the firm escaping the latest industry downturn. Meanwhile, GTC’s board and accounting appear quite conservative and I’d like to think the difficulties experienced during 2008 and 2009 can help this small-cap navigate the current troubles successfully. If profits can ever return to levels seen during the last few years, then my P/E of 5 at 33p would look an absolute bargain. However, I am not tempted to buy more shares right now, simply because GTC already represents 5% of my portfolio and I would like further clarity on progress from April’s interims first. The great dilemma I could face is that, before the next announcement, the share price drops further towards the 24p book value. You see, the last time it came very close to book value, the shares went on to rally eight-fold in four years! My understanding is that the depreciation and amortisation is larger than their capex spend. Could this indicate that they are not replacing their assets as quickly as they should? Secondly, whilst the current dividend yield is attractive how sustainable do you think this is going forward? You already allude to there possibly being no profits for 2015 based upon projected revenues for 2015. I agree the balance sheet looks strong but just wondered whether dividends would be cut to protect this? Finally, looking back at RNS announcements, there seemed to be some director buying late last year. The final question I have is about when do you make the decision to cut your losses? As a relatively inexperienced private investor this is the hardest thing to do. I’m curious as to whether you thought (or were tempted), to exit your position, and wait on the sidelines and buy back in, once the price of oil had stabilised. Well, possibly. Depends exactly what is going on. Generally, my depreciation plus amortisation check is to see whether earnings are being flattered by heavy cash capex. Most companies tend to have cash capex greater than D+A because i) D+A is based on the (lower) historical cost of assets and ii) they want to buy new assets to expand. The trouble is with reason ii) is determining whether the company is actually expanding or just replacing out-dated assets to sustain its current competitive position. I am generally wary of companies that have massive cash capex that exceeds D&A by a material amount — unless it is obvious the cash capex is expansionary. That sales calculation for 2015 was based on announced contracts only, so there is some potential for other sales that have been recorded but have not been announced. And that calculation is rough and ready and could be very inaccurate. But I thought I’d put my figures down anyway. I suspect current-year profits won’t be great and the forthcoming interim dividend may be sustained. Not sure about the full-year payout — maintained at best I suspect. The dividend was axed in 2009/10, so the board has ‘previous’ in this regard. It might be worth watching non-exec Peter Stephens. He is a venture capitalist and I noted he was buying at 11/12p in 2010. He has also bought at much higher prices, but at least he found the bottom at one point. A recent RNS indicated his wife had acquired shares — I do think when directors use their wives’ dealing accounts to buy (or perhaps it is the wife actually doing the buying), then they take extra care to make sure the transaction works out to avoid earache at home when the broker statements come in. I make my decisions to sell based on why I bought originally and what has changed. I reckon the business remains a respectable operator and that it’s the wider industry — rather than a failing with the firm’s geophysical data or the advent of a new competitor — that may cause sales to slide this year. The accounts and the management have not changed since my purchase either. And the share price is now in the doldrums, so to a certain extent it is too late to sell anyway. The time to have sold was when I sensed the recovery had stalled in 2013 (see that link in the text), though I probably would have bought back in during August at 54p! I have not been tempted to sell GTC, though I have only recently had a good look at the firm to make a fresh verdict. I think once it is clear the oil price has stabilised, the share price may be a lot higher than it is now. Just to add that GTC’s accounts show an amortisation charge based on an intangible purchase some years ago. There has been little intangible expenditure since, but the company (unusually and quite conservatively) does not strip out the amortisation from earnings to present an ‘adjusted’ earnings figure. Most other quoted companies would jump at the chance to flatter profits that way. Plus, GTC has not recorded any exceptional items, which again underpins the notion the accounting here is quite conservative. The final question I wanted to ask, but didn’t do very clearly (above), was do you use a stop loss when entering a position? No. I don’t believe they mix well with fundamental investing. Thank you for the thorough analysis. Getech has been on my watch list for a while and I was about to buy before the oil slump. Luckily I was able to avoid it. I have just taken a starter position last week and will see how it fares before topping up. I expect a fair bit of volatility for the next year but surely the oil price will stabilise?! I hope there will be a recovery for both our sakes. I have already been caught up in the oil price downfall with PFC, hopefully this will be a more profitable investment. Just out of curiosity, how low do you predict the oil price to go? Look forward to your next post. Good luck with your starter position. You are better off than me. Hopefully the oil price can stabilise (or even rebound) but I did not predict the slump and me projecting any rebound is sadly rather pointless :-) Most oil experts did not foresee the slump either, which also tells you something about forecasting the price. You have just got to assume it will recover at some point — if you don’t believe it will then there is no point holding any oil-related share. Let me add that I am assuming GTC will be affected by the slump — remember, it has not updated investors since November and maybe trading is actually going well! A very interesting update, thanks.